Award Winning Chili and Creamy Cornbread Muffins, a wonderful dinner combination for these sub-zero Midwestern temperatures. Several years ago, (2005 to be exact) our small town’s Chamber of Commerce hosted a chili cook-off. It was held in a lovely park located in the town square on a crisp fall day. On the west side of the park, the usual hustle and bustle of the Saturday morning farmer’s market was in full swing. Tables and chairs were set up around the beautiful gazebo located in the center of the park. And all of the chili cook-off competitors situated their booths around the gazebo. I had read about the cook-off in the local paper and thought that entering the competition would be a great way to spend a beautiful fall day with the family and to see how my chili would fare against the others. I had been serving this recipe for years and friends and family seemed to love it. The morning of the cook-off, we got up early, packed up the car with chili fixings and decorations for our booth. 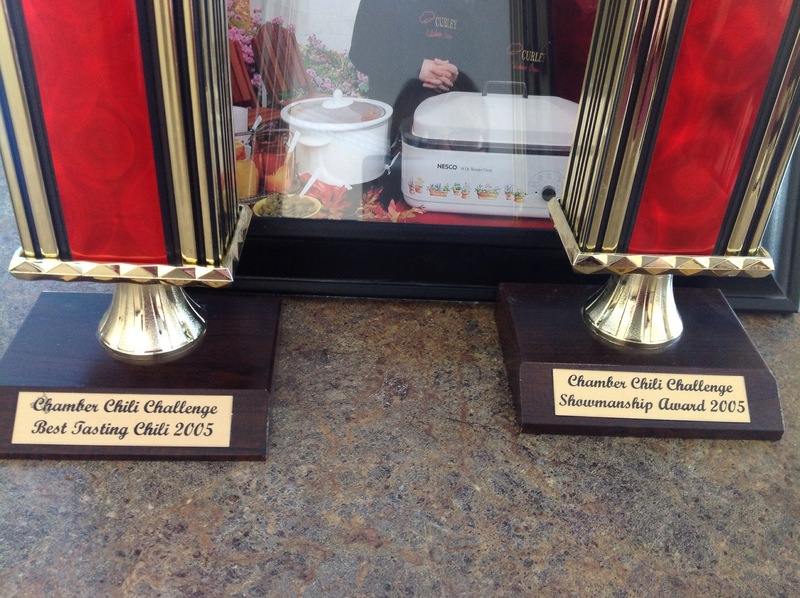 I was intent on winning the trophy for the best chili and the sportsmanship award, given to the most neighborly participant that had gone the extra yard to create a festive looking booth. I have an embroidery machine so I had embroidered custom attire for the day. I had purchased a few yards of cotton fabric to make chef hats and simple pants for the kids. We all wore matching embroidered sweatshirts to show off our family name. The kids were young and eager to help. They were excited about the festivities for the day. I have fond memories of this day as we did indeed win top prize in both categories. From then on, this has been the recipe that I turn to when making a big pot of chili during the fall and winter months. It’s actually a very simple recipe full of flavor and warmth. I must say, the weather these past several weeks has been brutal. I have been scouring my recipes to provide hearty meals for the family. It seems we are constantly out shoveling snow, heading off to work or school and returning home only to find that the snow needs to be tended to again. 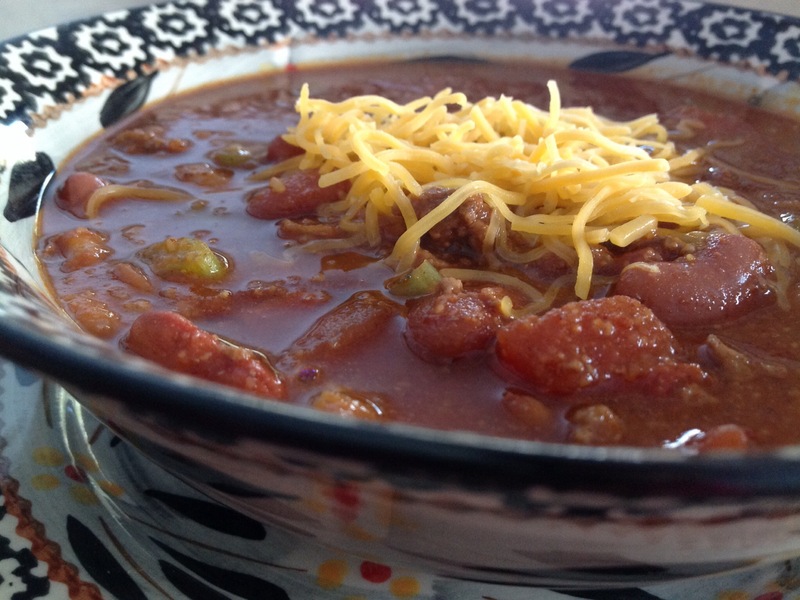 This chili recipe really hits the spot during the cold winter months in the Midwest. In a large pot over medium heat, cook bacon until crisp. Remove to paper towels. Cook onions, garlic, ground chuck and sirloin cubes in bacon drippings until brown; drain. Crumble cooled bacon and return to pot. Mix in the remaining ingredients and bring to a boil. Reduce heat to low, and simmer for 1 1/2 hours.